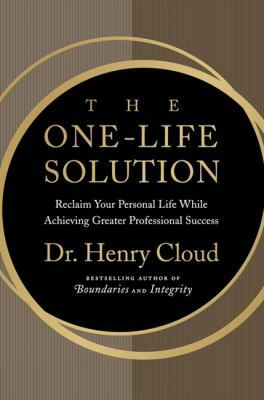 Renowned psychologist Dr. Henry Cloud shows how to make your job and your life work together for success and satisfaction, using principles that have proven successful in other areas and relationships.Dr. Henry Cloud's book BOUNDARIES has sold well over a million copies since its initial publication, and established itself as an undisputed classic in the field. Countless readers have benefited from its teaching that the secret to success without limit lies in setting limits to mark the things for which we're responsible.In his new book The One Life Solution, Cloud extends his bestselling formula to the workplace and convincingly demonstrates that setting physical, mental, emotional, and spiritual boundaries at work is not only helpful, but essential to establishing a successful, happy, and rewarding career.Cloud, Henry is the author of 'The One-Life Solution' with ISBN 9780061466427 and ISBN 0061466425. Loading marketplace prices 29 copies from $0.01 How does the rental process work?